About a month ago, I was teaching my ancient art students about the Colosseum in Rome. I pointed out the exits located the certain seating sections, embedded within the tiers of seats. This exit, I explained to my students, is called a vomitorium because it is the place where the crowd can “spew forth” and exit the arena. In a way, I think vomitoria are a good example of how Romans were thoughtful engineers, even down to crowd control. After explaining this term, though, I had a student raise his hand and explain that he learned in high school that a vomitorium is a specific room where Romans would go to vomit during a meal, so that the Romans could continue to eat more food afterward. Another student chimed in and mentioned that she learned this same information in a History of Theater class. I had never heard of this type of Roman room or an alternate definition of vomitorium apart from what I already knew in relation to the exits in an ampitheater, so after class I went online to check. I quickly learned that these two students were familiar with a popular definition vomitorium that is incorrect. There are several sites which mention this misconception of the term, and THIS ONE seems to be the most concise in its explanation. More scholarly and detailed discussion is located in an archived webpage from the American Philological Association (a group dedicated to Greek/Roman classical studies). For a greater history of this term and its use, see the comment left by Bruce at the end of this post. Bruce points out that Macrobius (in his work “Saturnalia” from the 5th century CE) uses vomitoria to describe places where men “pour forth” to their seats. There is concern that it is hard to combat this incorrect definition of the myth with the widespread amount of information available online. On one hand, I can see how this is true, because I did come across inaccurate information. I do hope, though, that commonly-checked sites like Wikipedia (which currently discusses the misinterpretation of the term) can help to dispel these misconceptions. Any other thoughts on how to help clarify this widespread vomitorium myth and teach the correct meaning of the term? On one hand, I’m a little disappointed that I am out-of-touch enough with pop culture that I was not familiar with this myth before this quarter (even my husband said that he had heard of the “vomiting room”), but I’m also really pleased that I only was familiar with the correct definition of the term! I’d heard about the Romans vomiting so they could eat more (in a romance novel, weirdly enough), but not about a specific room for it. So you’re not the only one! please accept my congratulations on your excellent blog. The first attestation of the erroneous use appears later, in Aldous Huxley’s novel ‘Antic Hay’ of 1923, according to OED, and there appears to be no ancient evidence for it. Nobody would doubt that you and the sources which you cite are correct, and that your students were misled by an urban myth. and (ii) Macrobius’s description appears to be inspired by the same image, so perhaps the word was not originally the ‘correct’ technical term, but rather a vulgar colloquialism, and its persistence into the modern world may simply reflect the continuing power of a very old metaphor to provoke a visual image in our minds. [There’s evidence of a similar history for the ancient Greek word ‘psalis’, sewer or drain, later also used for a theatre exit.] So I’d suggest that there’s no great harm in a myth as a starting-point, as long as we have good teachers to guide us to the right context? What I like most about this post, is that your students Caused you to question your own understanding, and the Effect that it had on you, was to seek clarification and then correct. In a way, your clearly comprehensive understanding of this topic was solidified due to the squabbling students. .. nice. Hello Bruce! Thank you for your thoughtful and detailed comment. I’m very interested in the historigraphy of this term, so I appreciate the dates and citations you wrote. I wasn’t aware of the Macrobius text from the 5th century; that seems to be a good starting point for the way that the term is used today among historians. (I have edited my post accordingly, after reading your comment.) After initially writing this post, I wondered myself if the myth would be a good starting point for students too. I may teach aspects of this myth and history, as long as I feel like my introductory students will not get confused! I do think, though, that this type of information is really important to teach to upper-level students. Historical terms constantly change in their definition over time, which is important for students to learn. So, I think that this history of “vomitorium” is an excellent case study for students of ancient architecture. Hi heidenkind and AS Net! Thanks for your comments. heidenkind: I like that you read about the Romans vomiting in a romance novel! That doesn’t sound too romantic to me! I wasn’t aware of how this part of Roman culture is so popular in our historical understanding of the Romans today. Sometimes I focus so much on the Romans in relation to art and architecture that I don’t consider other aspects of Roman culture! I’m always willing to look up answers to obscure and ancillary questions that my students might have. I think students appreciated that I helped to dispel this “vomitorium” myth, even if it pinpointed inaccurate things that these students had learned in a different classroom! As an Art History teacher myself, I was enlightened by your post. 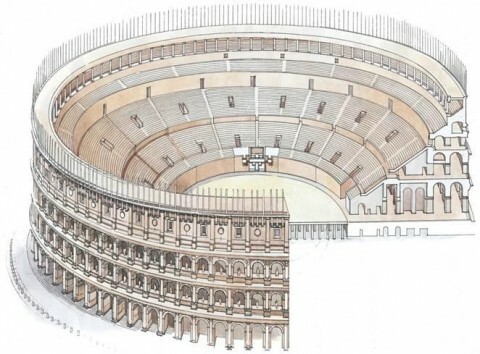 I learned that the vomitoriums of the Colosseum were not designed for any of the purging eating habits of Romans nor of the architectural design (that makes the most obvious sense now), but used as a place of refuge for spectators with weak stomachs during gladiatorial combats and other violent entertainment. Since these civic events were live, the violence and death was disturbing to viewers (men and women) who would leave their seats and run to the ‘vomitoriums’ for relief and possibly fresh air if possible. I didn’t give this area of the Colosseum any more thought until today so thank you for your post. Always glad to learn more. Hi Kait! Thanks for your comment. I’m always glad to learn more myself, which is one of the main reasons why I have this blog. Even if the word “vomitorium” was used in a different context than what you originally learned, I wonder if there are historical records which explain that the violence within the Colosseum was disturbing to men and women. (We obviously know the violence was immensely popular regardless of any potential disturbance, given how often events were held!) If I ever come across such texts, I will mention them in this comment thread.